Most executives that I talk to tell me that their journey to the cloud is more about business and cultural transformation than it is about technology adoption. To that end, I’ve been writing a series on a mental model that I call the Stages of Adoption, which highlights the pattern of activities we see inside large organizations that are reinventing their business using the cloud. I think of this pattern as an iterative and transformational journey, and one of my goals with this series is to give executives who are interested in transforming their organization an approach to do so. When I first published the opener for this series, I called the fourth and final stage of adoption “Optimization.” I was trying to suggest that, as the gravity of your IT portfolio shifts from on-premises to the cloud, each application will be easier to constantly optimize once it is migrated from on-premises to the cloud. While this is true — and I’ll elaborate on this point in a moment — I’ve come to believe that the term “Optimization” undersells the possibilities for organizations that make it to this stage in their journey. Most large cloud migration efforts are backed by a business case that quantifies an end state. When I was at News Corp, for example, our business case was to migrate 75% of our infrastructure to the cloud over 3 years to achieve $100M in annual savings. This type of objective seems to have become quite common — dozens of executives have since told me that they are looking to migrate 75–90% of their IT portfolio to the cloud in the next 3 years. So, to more precisely articulate what we see in organizations that are investing in cloud-first strategies as they constantly evolve their business, I’m rebranding the fourth — and never-ending — stage of adoption to “Reinvention.” I’m also kicking off a mini-series on what goes on inside companies that have migrated large portions of their IT portfolio to the cloud and modernized their culture in the process. Throughout this mini-series, my team and I are going to attempt to cover the impact on organizational culture, give some examples of customers who have reinvented themselves using the cloud, and show that migrating your IT portfolio to the cloud is only the beginning of what’s possible. — Yury Izrailevsky, Vice President of Cloud and Platform Engineering at Netflix. (Full quote here). Yury’s seven-year cloud migration at Netflix is both instructive and inspirational, and the re-architecting he led helps explain how Netflix was able to remain a dominant brand in its industry as the video streaming market evolved. Most companies aren’t Netflix, though, and we see a lot of companies that favor a rehosting (a.k.a. “lift-and-shift”) approach to migrate applications faster, which then makes it easier to optimize over time. I highlighted this natural tension between re-architecting and rehosting in a recent post on 6 Migration Strategies, and I’ll expand on it a bit more in my next post. Before I close, I’d like to issue a call-to-arms to anyone who has experience leading their organization through the stages of adoption. Other executives are eager to hear about your journey, and I’m eager to host your experience here on my blog. Salvatore Saieva, the CTO Lead for Public Cloud Projects and Initiatives at AIG, recently wrote about AIG’s journey, and I know there are more good stories out there. If you’re interested in telling your story and attracting talent to your organization, please email me (orbans@amazon.com) with your ideas, and we’ll tell your peers about it! 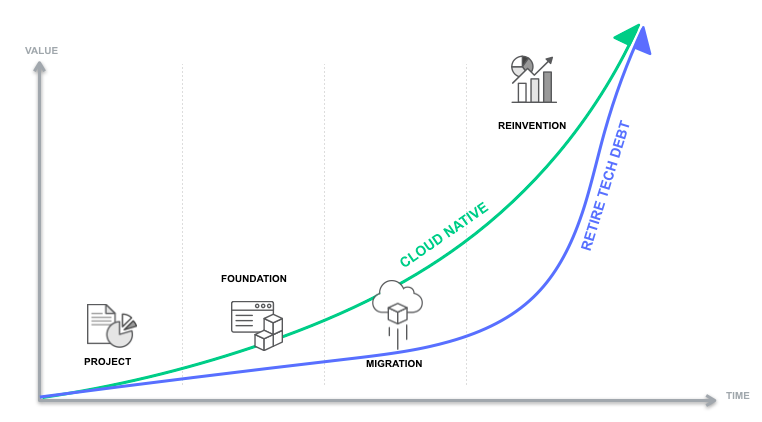 Note: “Reinvention” is the fourth (and never-ending) stage of adoption I’m writing about in the Journey to Cloud-First Series. The first stage is “Project,” the second stage is “Foundation,” and the third is “Migration.” This series follows the best practices I’ve outlined in An E-Book of Cloud Best Practices for Your Enterprise. Stay tuned for more stories posts in this series.